Recent issues with wolves developing a taste for mutton and at least one grizzly bear in Eastern Idaho seems to like veal (he killed a calf), have Idaho wildlife managers caught in a bind. Historically, ranchers and settlers spent many years and bullets wiping out the predators to insure the safety of their flocks and herds. Then conservationists “reintroduced” wolves and grizzly bears were protected on the endangered species list by well intended conservationists. Then along came the developers and politicos bent on increasing the population, creating tourist attractions, and instant news reports detailing every encounter in the wilds. 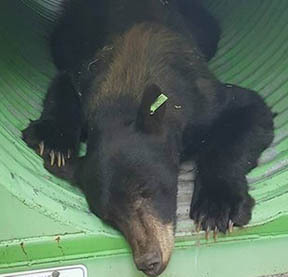 In Pocatello a black BEAR found it so “unbearable” (sorry, we could resist it) he broke into the zoo just to have a place to sleep and some company. Eastern Idaho has seen two grizzly encounters in the past week, one bear was killed and another TRAPPED and relocated. Meanwhile, more than 100 ranches had wolf or bear incidents last year, setting a record for depredation incidents, according to a REPORT by Betsy Russell at the Idaho Press. As Idaho continues to experience rampant growth and claim top rankings as the fastest growing state we can expect to see critters like cougars and coyotes in our back yards while their former habitat is paved over by developers. The population of the invasive species of wolves is currently more than 10x the amount the Fed planned for. Many forests in NE Idaho and other places have seen a reduction in elk and moose populations of 97%. As for bears, the numbers quoted are average. Predators need culled and reminded to stay away from people. Hunting is the most effective and efficient method to do so. Aren’t ranchers still being fairly compensated for their wolf-depredation losses? I agree with Tania about the ultimate invasive species, whose drive to be fruitful, multiply, & take dominion has driven the entire planet Koyaanisqatsi. Dare we suggest that the world may be suffering from testosterone poisoning? Humans account for about 36 percent of the biomass of all mammals on Earth. Domesticated livestock, mostly cows and pigs, account for 60 percent, and wild mammals for only 4 percent. The same is true for birds. The biomass of poultry is about three times higher than that of wild birds. Does anyone remember the Biosphere experiments where a massive sealed dome was very carefully stocked with plants, insects, mammals, reptiles and humans and was designed to last as long as possible? We did this twice and once the humans ran out of air and had to be rescued, the next time the ants took over. The lesson is that we humans have zero idea about how to create a sealed survivable ecosystem, yet are constantly “managing” the ecosytem on the only planet we will ever know. The nonsense we hear endlessly about somehow living on Mars is just laughable. How long till we miscalculate and ruin the only planet we will ever know? Lucky for the bears and wolves they taste icky. Off topic but springing from the biodome comment. First we had ‘global cooling’, then ‘global warming’, then they settled on ‘climate change’ so they won’t look stupid. All the low information TV watchers have been force fed two decades of panicky messages about climate change. Governments have captured the trend for tax increases. Some of the biggest financial backers of the climate change doctrine are the corporations who are at the same time polluting our fresh water and oceans. The temperature of Earth does flex up and down. We had ice ages and heat waves long before humans built their first cooking fire. The air pollution is bad but cleans up fairly quickly. However the water pollution mess we’ve made and continue to make will take thousands of years — if we stopped polluting now. My point is our governments and corporations are distracting us away from our most worrisome concern, water pollution. Do some sniffing around in the reference sections of those wiki articles. Pretty frightening, and not a peep on CNN or The Weather Channel. Predators seek prey. They seek the easiest kill. A cow is rarely a fast moving target. My great grandma told us about the day a pack of wolves attacked their horses on their small farm in a remote area of Utah in the 1800’s. They weren’t intruding on these predators! There were hundreds of miles and plentiful game for them. Predators are great planners. We will never be able to create an ecological paradise because we can’t control the unexpected By the way for all predator lovers who think humans are to blame…we too are predators. This is where enviros and growth-adverse folks can come together. Buildouts and run-amok real estate will only prove to drive more conflicts between wildlife and humans. There really is such a thing as too many people in a given space. Don’t let Idaho turn into the foothills of Southern California. There needs to be a “just right” formula for people’s communities. That’s not being xenophobic, it’s being smart. It would be called…..Smart No More Growth. That would force people migrating away from the S-holes of PelosiLand to find other places that could actually use more people and their skills. Boise needs to STOP promoting itself to the world. Our intake rate doesn’t need anymore prompting. REPLACE Team Dave!